When Douglas Wood was in the second grade, he was the poorest reader in the entire class. He also struggled with ADHD, long before anyone had heard of such a thing. But Douglas had a special teacher, a teacher with wisdom and patience, a love of children and a love of books. A teacher who would not let him not learn how to read. And along the way, she passed on a very important gift, a gift that can change a life—the gift of a love of reading, a love of books. 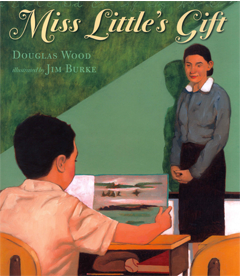 And many years later, when he had become a “famous author,” Douglas gave back a gift to Miss Little. Once in awhile, along comes a day when there is nothing, absolutely NOTHING… to do. And isn’t that…..GREAT!!! 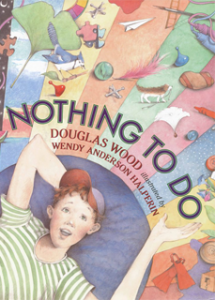 So begins one of Douglas Wood’s favorite children’s books — and it’s an important part of his philosophy, as well. Often we find that in remembering our own childhoods, many of the happiest memories are not of planned and scheduled events, but of time we had to ourselves — to just be ourselves. To day dream, to explore, to figure out who we were. Today’s world moves at a faster pace, but kids still need unscheduled time — to relax, to think what they think and feel what they feel, to discover who they are and how the world works. So do grown-ups. In fact, sometimes “nothing” is the most important thing in the world to do. Perhaps there’s a reason we’re called human beings and not human doings.